If you're traveling for an extended period or moving to a new address, making sure that your mail is forwarded to the right address is important. The United States Postal Service offers Regular Mail Forwarding as well as Premium Forwarding Service options to help with your move or travels. 1. Regular Mail Forwarding via USPS - The USPS can forward your mail to a new or temporary address. Both Temporary and Permanent mail forwarding requests can be performed either online or by stopping by your local post office and asking for PS Form 3575 or a change of address form. 2. Premium Forwarding (Residential) Service via USPS - If you want to receive your mail quickly while traveling, USPS can hold, package and ship your mail to your temporary address for a weekly fee of $17 (or $16 online). This Premium Forwarding Service Residential (PFS-Residential) service is a temporary service that can be used from 2 weeks up to 1 year. You will need to enroll in this service either online or stopping by your local post office. Most of your mail will be packaged on Wednesdays and sent through Priority Mail service within 1 to 3 days depending on distance. 3. Forwarding Period- You can have your mail forwarded by USPS for a minimum of 15 days and a maximum of 1 year (regardless of it being a temporary change of address or premium forwarding service). If you requested for temporary mail forwarding, the service will automatically end on the date you specified on your change of address form. 4. Permanent Change of Address - Once you complete either the online Change of Address request or PS Form 3575, mail will begin forwarding to your new address, piece by piece for a year. Note that forwarded mail may be subject to additional postage depending on what type of mail it is. Also, packages will not be forwarded, and magazines will only be forwarded for 60 days. 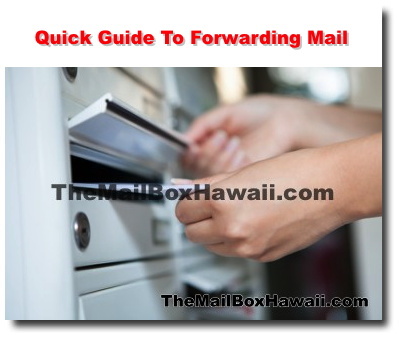 For customers of "The Mailbox - Postal Services of Hawaii" which has recently closed, all mail has been delivered to the Makiki Post Office and available for pickup until 5/4/2015. Please fill out the form on this website to receive "Official Copy" from United State Post office with other instructions, forwarding options, etc. To learn more about changing your address, read our tips on Managing A Change In Address.